Nothing goes with tailgating like great beer. If you need a great beer quick, you can have these beers ready to serve in 10-14 days if you keg and about 21 days if you bottle. All grain recipes are formulated for 70% efficiency. A dark mild is a low-gravity, malt-focused British session ale. It’s refreshing and quaffable and will please both craft beer drinkers and those who think “dark beer” is a craft beer. Full with flavor, it’s approachable and with a low ABV so you can enjoy more than one. This recipe easily goes from grain to glass in 10 days. It’s delightful with a lower carb level, so once you keg it’s easy to quick carb it and serve. Mash the grains in at 152 in one gallon for 60 minutes, then sparge (rinse) the grains up to your boil volume. Add the first addition of extract, and bring to a boil. Add the first hops addition, and begin timing for 60 minutes. At the second addition of hops with 10 minutes left in the boil, and add the final addition of extract when you turn off the flame. Mash at 152 for 60 minutes. Use Irish moss or whirlfloc with 15 minutes left in the boil, if desired. Ferment at 65-68 degrees for approximately one week or until clear and at FG for at least 3 days. The “fizzy yellow beer” is an ale version of a crowd favorite. It’s approachable by light beer drinkers, but still with enough flavor to satisfy the beer snob in your midst. This beer is simple, but simple can be wonderful. It’s a clean tasting beer like a macrobrew, but with a bit more flavor. Still low in alcohol for those “have more than one or two” days, it can be enjoyed during tailgating and throughout the fall. You can substitute other noble hops for the tettnanger and perle with good results. 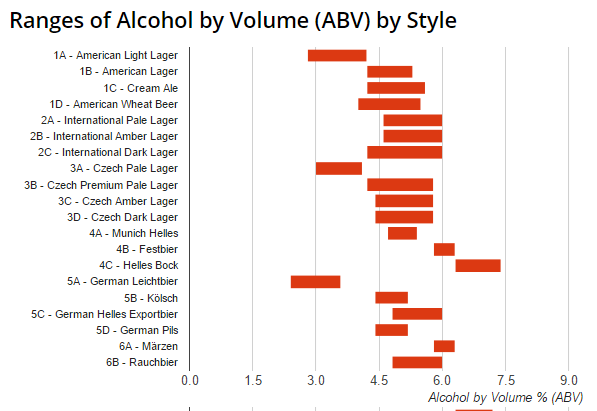 Magnum is a good bittering hop, just make sure to calculate for the high alpha acids in a different hop variety. 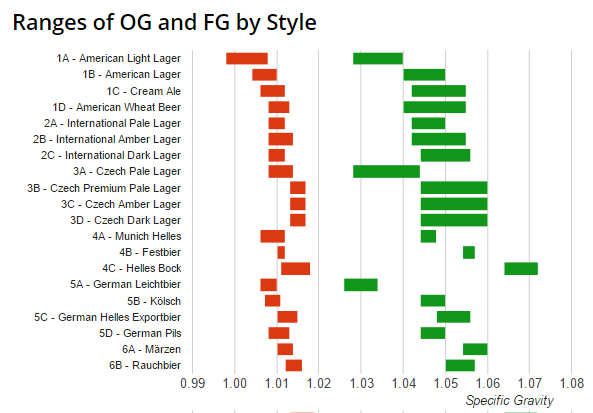 Hallertauer would be great, and saaz would also make a fine finishing hop. If you can’t find Vienna LME, you can substitute pale LME but the Vienna flavor brings so much to this beer that it should be sought out and used if at all possible. London ale yeast is used for this recipe because it is fairly “clean” at low ale temperatures and leaves a clear beer behind quickly. You can substitute another yeast strain if you have a favorite. Using whirlfloc or Irish moss in the boil will help with having a clear beer quickly. Ferment at 65-68 degrees for about a week, or until the beer is clearing and is at FG for at least 3 days. Prior to these changes, we calculated FWH additions as if they were regular boil hops with a duration of 20 minutes. This was due to subjective reports of the bittering contribution from FWH resembling a 20 minute hop addition. This doesn’t really capture the essence of what’s happening with first wort additions, since the hops contribute bitterness both during the pre-boil time as well as during the entire boil. To fix this, we’re changing the way these additions figure into overall bitterness. Instead of a fixed time duration, FWH additions now are included for the entire boil duration (based on what’s entered for boil time in each recipe), and are given a percentage boost in utilization to account for the additional time spent steeping before the boil. Typically this factor is an additional 10% boost over a regular boil hop, but this value can be customized based on individual findings. 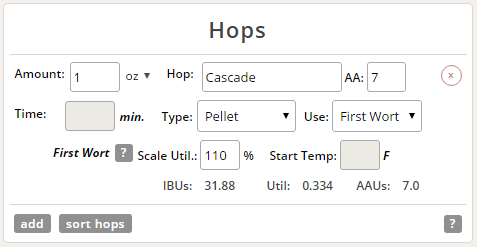 Now, when you select “First Wort” in the “Use” field on the recipe builder, you’ll notice that there’s now a “Scale Util.” field, which holds the overall utilization multiplier. That means if you want to boost the FWH utilization by 10%, you’d enter 110% in this field. If you think the additional contribution is more like 20%, you’d enter 120%. And if you think a first wort hop behaves exactly like a boil hop for the duration of the boil, you’d just enter 100%. We know there are thousands of recipes that have been built on the previous FWH functionality. And we know how seriously we rely on our recipe metrics to remain stable and predictable as we brew, rebrew, and experiment. 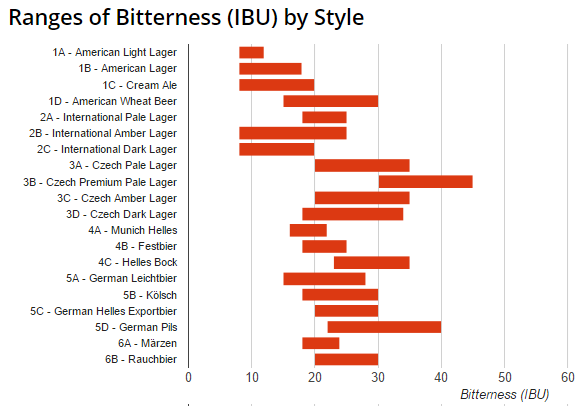 To that end, we’re taking every existing recipe with a FWH addition and we’re calculating the utilization scalar that results in no IBU/bitterness changes. So when you open those recipes, you’ll notice that the stats don’t change as a result of this. If you look under the existing First Wort hops, you’ll see that we’ve filled in a utilization percentage that equates to the IBU numbers you had previously. If you want to adopt the new approach for an addition, you can simply change that value to 110% and you’ll get the new calculation. Any new First Wort hops you add will default to the 110% number. We also brought it up to speed with the latest BJCP 2015 style guidelines. This means you can create recipes in the latest styles on the app and also that recipes coming from your Brewer’s Friend account will sync properly now. We know we’ve had a rocky road with the Android app, and we REALLY appreciate everyone’s patience, and especially the feedback and testing you’ve helped us with. We know there are lots of other very important requests and serious issues we still need to address, but we anticipate this is just the first step of many we’ll be taking. We plan to continue releasing updates regularly now that we’ve gotten back on track, so please stay tuned for more announcements to come. BJCP 2015 Styles – Yes; we’re finally catching up to 2015! 🙂 The addition of the new BJCP styles has been long overdue in the app. As we did on BrewersFriend.com, we’ve kept the 2008 guidelines available, but by default new recipes will use the new 2015 styles. Now when you sync recipes between the app and the online version you can rest assured the style will come over correctly. New Fermentables, Hops, and Yeasts – We’ve updated the app with the latest information and ingredients from our database, giving you more options in your mobile brewing and again ensuring your recipes sync correctly. Misc. Visual Fixes – There were a handful of annoying user interface bugs in the old version of the app, including scrolling issues where entry fields were hidden, buttons disappeared, etc. We worked through a number of these to make the app more stable and usable. It’s been quite a while since we last updated our app, but we’re committed to making these updates more frequently going forward. Quite a few feature requests, bugs, and improvements have stacked up on our TODO list since we last updated, so we have a long list to catch up on. Please stay tuned if you’re still having other issues or your feature hasn’t been added yet and we’ll be working hard to get through all of them. Thanks to everyone who’s submitted feedback and for your patience as we update. If you have additional feedback or bugs to report, feel free to use the links within the app to connect with us. It’s been a busy few weeks here at Brewer’s Friend, but we have another feature we’d like to announce. The recipe builder is the core and most important tool we have here and we take feedback and ideas on it to heart. We’ve continually gotten requests to provide the ability to search for fermentable ingredients when creating a recipe, improving on the traditional dropdown menu of sorted ingredient names. We’ve now integrated a filtering & searching capability into the fermentable & steeping grain selection boxes on the recipe builder. So when entering ingredients, you can simply begin typing what you need and it will filter down the list to just what matches. Once you select the ingredient, it behaves the same as it always has, but this should help save us all time as we choose our grains, extracts, etc. And please keep the feedback and ideas coming. The best features and improvements come from you, our awesome brewing community. We’re really excited to share two of our largest announcements ever! Read on for details on how we’re improving the Brewer’s Friend website and making it more convenient to brew your best beer. As you all know, the Brewer’s Friend website has always had a quirky look and feel that seemed a little dated, but got the job done. Over time, we’ve seen website design evolve quite a bit and new techniques have come along to make things better for mobile browsing, performance, and user interaction. As a result, we’ve been working hard on completely re-skinning the site, while enabling a more mobile-friendly UI and more modern appearance; all while preserving the exact same core functionality and tools that we all know and love. That work has finally paid off and we’re excited to unveil the new look of Brewer’s Friend! As you’ll notice, we’ve breathed new life into the color scheme, fonts, and layout. But if you look deeper all the buttons, data, bells & whistles are all exactly where you left them, just with a fresh coat of paint. Our goal is always to make your brewing the best it can be, so we did our best to keep the functionality of the site as familiar as possible. As homebrewers, we’re always looking for the best way to get the best ingredients for our beer. Usually, this involves pulling up our recipe, jotting down the list of things we need, how much of each, preferred brand, etc. Then we go to our favorite LHBS or online homebrew supply and individually pick out each product. And inevitably something is missing or out of stock and then we get to consult substitution charts, or rework our recipes. Frustrating. We gave this process a lot of thought and we’re very proud to announce a new feature that we believe solves this problem. In partnership with HomebrewSupply.com, we have built a one-click ingredient ordering system for all Brewer’s Friend recipes. Now when viewing or editing any recipe on the Brewer’s Friend site, you can now click “Buy Recipe Now” and you’ll immediately see a list of the ingredients & products you’ll need to brew your recipe, the quantities needed, and even recommended alternatives when necessary. You can quickly review this list and then add your ingredients to your Homebrew Supply shopping cart in one simple step. Behind the scenes, the system takes your list of ingredients and carefully matches them to products that should fulfill your recipe. If there’s more than one product that could be used for your ingredient, you’ll be given those options so you can tailor your brew to your brand preferences, etc. So if you have “American – Pale 2-Row” in your recipe, you’ll be given the options for Rahr 2 Row as well as Briess. And you can even make a selection for your grain milling preference for the recipe before placing the ingredients in your cart. Made improvements to the Brewer’s Friend Windows App – fixed some bugs in calculations on the brew day feature and added better support for US units, especially when making brew day calculations. Fixed a bug on the My Recipes page that occasionally caused crashes related to Brew Session data. The page should be more stable overall now. 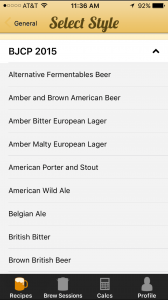 Released two updates to the Brewer’s Friend iOS app – fixed some formatting issues with certain fields in the brew log. Released a full updated to the ingredient data in the app, including hops, fermentables, and yeast. Our First Recipe Giveaway Winners! Our first ever recipe kit giveaway concluded this past week, and we’re excited to announce the winners! Each winner will receive a recipe kit from HomebrewSupply.com. We’re really excited about these improvements and new features and hope you’ll find them to be helpful in your homebrewing experience. Thanks to all of you in the Brewer’s Friend community for helping us make our tools the best they can be, so we can make the best beer together.